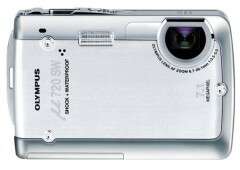 The Olympus Stylus / Mju 720SW has a LOT going for it, and would be especially suited to someone who wants to take their camera with them everywhere they go, especially if they’re prone to dropping things, getting things wet, getting things dusty. The shockproof and dustproof qualities, and the solid build of the digital camera is likely to make the digital camera last much longer than other digital cameras, this makes it excellent value for money compared to less solid digital cameras. Image quality was generally good, although slightly under-saturated for some people’s tastes, and images were slightly soft. Noise was quite well controlled. The camera is very easy to use and there were several features built into the camera to help get better results, such as the digital image stabilization mode and numerous scene modes. ComputerAct!ve (dead link) reviews Olympus Mju 720 SW digital camera and concludes with overall rating of 4 out of 5 that with a rock-solid build, large LCD screen and easy-to-navigate features, the Olympus 720 SW looks likely to kick sand in competitors’ faces. The good points are built like a tank yet compact and lightweight, waterproof and shockproof plus good image quality, while bad point is small controls. DigitalCameraReview concludes that Olympus Stylus 720 SW was designed to withstand total immersion in water, extended exposure to mist, rain, snow, sleet, rain forest style humidity, dust, and ocean spray, plus the hard knocks and occasional slips and falls associated with active lifestyles. It is small enough to drop in a shirt pocket, tough as nails, easy to use, and retains all the style of its classic Stylus film camera ancestors. I didn’t take the camera underwater, but I did take it out in the rain a couple of times with no ill effects. Dedicated underwater cases for compact digital cameras generally run at least half the purchase price of the camera, so the 720 SW’s $400.00 (underwater ready) price tag is a real bargain for snorkelers, sailboarders, boaters, swimmers, water skiers, seashore lovers, and beachcombers. The 720 SW’s images are a bit soft overall, but when the camera’s underwater capabilities, dust/weather resistance, and general toughness are factored in – I believe its strengths outweigh its weakness by a substantial margin.